I am sure that this varies from guy to guy, but I am curios. This could be a much more in depth subject, and if it goes that way... oh well... but my question is really simple. Do you prefer a woman who wears make-up or goes natural? Or anywhere in between? Why? I, myself, am an 'almost never' girl. If I feel like it I might wear it for a wedding, or other really special event. Maybe if a guy says 'dress classy, I'm taking you out'.... maybe... but that's never happened. lol When I do wear it, it's really simple. A little around the eyes and some lip gloss. I guess I'm curios as to whether it is more common for guys to like make-up on a girl, or not, or if it REALLY varies A LOT from guy to guy. Libs, anyone who has been around here a while knows my distaste for makeup and cosmetics in general, especially nail polish. But since you're relatively new here, I'll elaborate a bit further. The way I look at it, God created women to reflect His beauty. He didn't create the first woman with a face full of makeup, she was naturally beautiful and perfect already. Why would you want to cover up what is naturally perfect with nasty chemicals that is man-made and imperfect? Plus makeup is so bad for your skin. So on a aesthetic and practical level, I abhor makeup on girls. I'm all natural all the way. Whatever she does is fine with me. A mystery is a mystery. Wrapped in gift paper or not, it does not lessen her appeal from my perspective. I am more interested in her than the gift paper. I would love to discover her, regardless. Not a dude (as most of you should know by now! ), but this is an interesting question. Whether or not I wear makeup actually depends a lot on where I am: at my college in New York, most girls wear very minimal or no makeup, while in Texas, it's unusual for a woman to step outside her door without at least six products on her face! So I adapt wherever I go to blend in with the locals. Personally, I love wearing makeup. I don't do it so I can cover up my flaws or attract a partner; I do it because it's another form of self-expression, like picking out nice clothes or putting on earrings that suit my mood for that day. Art for the face, basically. I find that women look best when they're doing whatever is most comfortable for them. My friends who love wearing makeup always look fantastic in it, and seem somewhat off if they're bare-faced. Likewise, the girls I know who don't like wearing makeup look best without any on, and seem kind of uncomfortable/awkward when they do feel like they have to wear it for whatever reason. Lol Definitely not a dude either but I'm more natural than anything. I believe a woman should be natural. Too much makeup hides natural beauty. I can see the occasional eye liner and lip balm but foundation and that other stuff I think it's concealer...... Conceals too much. I've seen so many wear makeup around their boyfriends or courters and when they are married they finally take it off and the guy is shocked and feels like the woman falsely identified herself. Of course they got over it but to much means unhappiness with ones self in my opinion. I used to view makeup as 'enhancing' but I realized it was masking a lot of things. Of course this is my view. I used to bleach my hair blonde and wear a lot of makeup because I grew up watching my mom do it and I was fascinated at first, then I woke up one day and decided it was better for me to accept my born-as beauty and stop being vain. I have to admit men do not pay as much attention to me, but I look at it as weeding them out to find the guy that will . I do feel more beautiful AND it doesn't take me two hours to get ready anymore . That SUCKED. I do still wear mascara, though. The blonde eyelashes take some time to get use to. Personally, when I went through this epiphany, I would look at women and feel pain, which was strange, but I know how insecure women can be and they like to hide things, and it makes me sad. And like Steadfast, there are women who wear it just because they want to. If men don't have to wear makeup, women should not have to. Women are gorgeous without makeup. It makes me so happy to see women who can flaunt themselves in their skin, wearing little to no makeup. Steadfast, you are so right! Men claim they like women who don't wear any makeup but then the girl is wearing it, it just looks natural LOL! I'd say no in most cases. Half the reason for what it probably does to your skin over time and the other half I only ever notice when there is too much on a girl so, its not really needed in my opinion. Fake tan I don't think is too bad, not from experience lol. I read the question and IMMEDIATELY thought the same thing. I figured all the guys would claim to prefer the "no makeup" face, but most guys say that without knowing what women really look like without makeup. For some pictures for comparison, these two articles are good. That being said, BB cream has helped get rid of my hyperpigmentation marks (that were present for years, no joke) to a great degree, with no side-effects on my skin. Slightly OT -- what BB cream do you use? I got some hyper pigmentation during my brief stint on the pill, and nothing has made them go away! 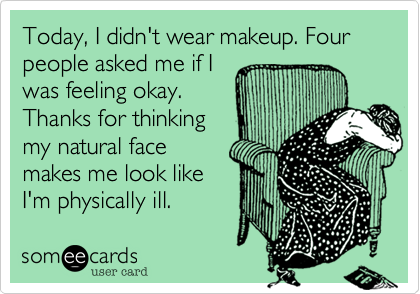 And yeah, makeup only makes you break out if you don't take it off at night, or if you keep products for way too long. They certainly can't be any worse than the other unnatural stuff we put on our bodies all the time. And we all do things to try to improve our appearance -- makeup isn't inherently more vain or deceptive than anything else. You ladies are so cynical. lol. Yeah that's probably true that many guys can't tell and think a girl's not wearing makeup when she in fact is. But I can assure you that I can, seeing how I grew up in a household full of women. Quite frankly, if a girl's face doesn't have any acne or any other kind of small blemish, I know she is likely wearing "natural" makeup. The thing is that acne and pimples are a fact of life. I have them, you have them, pretty much everyone does. There's nothing hideous about them even if that is what society is telling us. Honestly I don't have a huge problem with light, "natural" kind of make up and I can understand applying a little to hide small blemishes (even though I don't think they are the end of the world like most people believe). I just can't stand it when girls plaster their faces to the point where they look like Bozo the Clown. When I was about 6 or 7 years old, I was over at my cousins' house for the day. They were siblings, one boy and one girl. I was sitting waiting TV with boy cousin while girl cousin was sitting nearby painting her nails. The room was quiet and I was zoning out really quickly. All the sudden out of nowhere, my girl cousin lets out a gigantic fart that was loud enough to shake the heavens. I had no idea that it was possible for me to scream in such a high pitch voice until that day. After the dust settled, my boy cousin looked at me and said, "You see, Vince? Nail polish makes girls fart louder and more often." This actually reminded me of a waaaaaaay less innocent truly horrifying story involving nail polish. You can find it here. Warning: some sexually explicit language, as well as some grossness that will haunt your dreams for years! I think if a girl wants to wear a little makeup it's ok. However, I only like the makeup that makes you look like you're not wearing make up. I also think that you should show your real face to people. I know a few girls who wear make up and when they take it off you can barely tell it's them lol. I hate much makeup on my face. For me.. makeup is strictly for the nightclub.. a musical performance.. or a job interview. For everyday life all I use is a tinted moisturer ( find out what I mean here) and Mascara. It's kind of fresh and real looking. Allows natural beauty to stand out. @charlemagne first girl is highkey hot i like creative makeup too. I don't really mind either way, as long as it's not worn all the time. It can be bad for your skin but it can look really cool when girls have coloured or candy lipstick, unusual stuff.